*Note: The average maximum capacity for the MDS shelf is 12 standard-size 750mL Bordeaux bottles. Storing larger bottles, such as Pinot Noir and Rhone, may decrease shelf capacity. Will EuroCave Main du Sommelier Rolling Shelves fit vielletheque? BEST ANSWER: These shelves will fit the Comfort/ Performance/ Premiere/ Pure Eurocave lines. Will this work for the Eurocave-V-264? Do these fit the EuroCave V-266? BEST ANSWER: Yes. They fit mine and install very easily. I would expect Wine Enthusiast to answer this question. In general the Euro Cave Sommelier shelves fit the Euro Cave storage units. Absolutely, they will fit beautifully in your Comfort 266. They also fit my Allavino shelves. Nice! Will they fit in a FOCO EuroCave Comfort Vieillitheque V-264 Meca? BEST ANSWER: These should fit in a Comfort V-264, yes. How much h is a euro ave v-264w..? BEST ANSWER: Do not have any idea what Mike is asking. What are the dimensions? Width x height? BEST ANSWER: These particular rolling shelves for the (performance & comfort series) are meant specifically for the Comfort, Performance 283, 183 and 83 as well as the Premiere and Pure lines. I added these shelves to help organize my collection and make it more accessible. I like the plastic cradles as they are very adjustable and this helps with some odd shaped bottles (at least on the ends of the shelves). A sale price and free shipping made the sale. Very pleased. The shelving arrived in two very high quality boxes stuffed with packing material. The shelves were in excellent condition and we had them unpacked and installed in less than an hour. Love the roll out shelves. It is important to load the shelves evenly. Our favorite victor is Epich and their bottles are large and heavy. Had to increase the space between rows. I bought the six rolling shelves so that I could easily access any bottle of wine in my Eurocave. 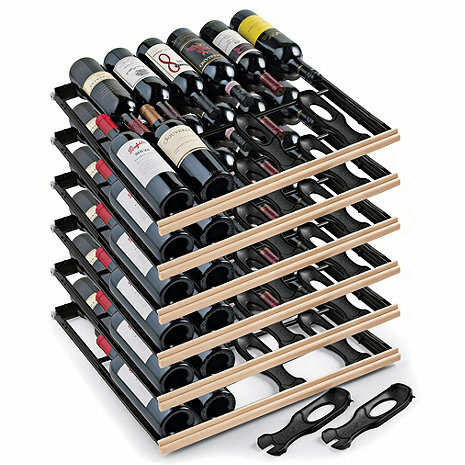 The "Main du Sommelier" version is nice but I liked the previous version (flat rolling shelf) better, as it was actually more versatile in handling bottles of various dimensions (including magnums or other taller bottles). I also wish they had not changed the wood trim color. This being said, they fitted my Eurocave Comfort perfectly. I now have 10 rolling shelves and 2 fixed shelves (the 2 bottom ones) in my Eurocave.